Christening and launching ceremonies were held recently at the San Diego yard of National Steel and Shipbuilding Company (NASSCO) for the Coast Range, a 37,500-dwt products carrier under construction for Union Oil Company of California. A gathering of more than 400 invited guests witnessed the ceremonies. Sponsor for the ship was Mrs. Peggy Hartley, wife of Fred L. Hartley, chairman and president of Union Oil and key speaker of the day. Mrs. Carol Barnett served as matron of honor; she is the wife of Elton P. Barnett, vice president, refining and supply, Union Oil. Other participants in the program were C. Larry French, president of NASSCO, and John M.
Murphy, NASSCO's vice president of corporate relations. The Coast Range is one of three sister ships that NASSCO is building for a subsidiary of Union Oil; all are scheduled for delivery in 1981. These Carlsbad class tankers are a new NASSCO design, powered by General Electric 13,000-shp steam turbines. Each ship is 658 feet long with a 33-foot draft and carrying capacity of 300,000 barrels, and will be capable of transporting 10 different products simultaneously. They will carry products from Union Oil's refineries in Los Angeles and San Francisco to Alaska, Hawaii, and other U.S. West Coast ports. West Coast Shipping Company will operate the vessels. With a cylindrical bulbous bow to improve propulsion efficiency, the vessels will incorporate the most modern equipment available. They will meet the latest safety and environmental protection standards, including double bottoms, a clean segregated ballast system, an inert gas system, a sewage treatment plant, collision- avoidance radar, and a backup steering system. They will be classed by the American Bureau of Shipping. The vessels were ordered by Union Oil in April 1979, and are being built entirely without Federal subsidy. The keel for the Coast Range was laid in June 1980, and delivery is scheduled for July this year. NASSCO currently has under contract five additional products carriers, three Navy destroyer tenders, and a Navy cable repair ship. At the end of 1980, the company's backlog of new construction and repair work stood at about $735 million. 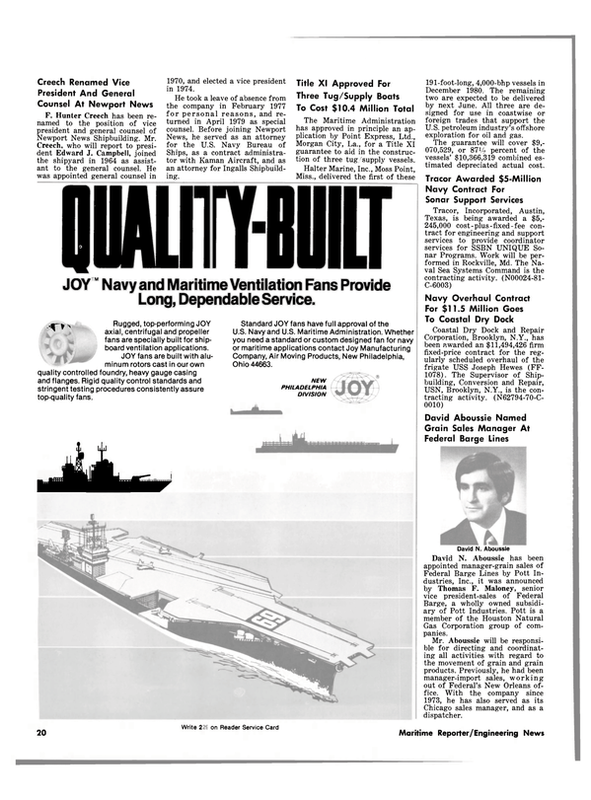 The San Diego yard has been engaged in marine construction for 35 years, and is wholly owned by Morrison- Knudsen Company of Boise, Idaho.